Bet Coin Poker has announced their participation into the Winning Millions $1 Million Dollar Guaranteed Poker Tournament, which will be held on the Winning Poker Network on December 14, 2014. BetcoinPoker.com is proud to officially announce the 1,500 BTC ($1,000,000) GTD Winning Millions Online poker tournament with a 1,500 BTC ($1,000,000) guaranteed prize pool. This event is set to take place December 14th, 2014. 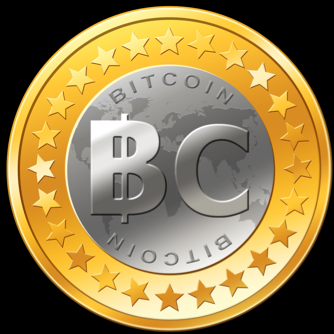 “We are excited to offer the bitcoin community the opportunity to earn truly life changing money”, stated BetcoinPoker.com. “With a prize pool of this magnitude that will guarantee the winner 330 BTC ($200,000) this can truly change the life of the winner and all top finishers”. Qualifiers for the 800 credit (0.800 btc) + 65 credit (0.065 btc) – ($500+$40) buy-in tournament are available now. BetcoinPoker.com will also own a series of private satellites to qualify for the Winning Millions tournament. With extremely fast payouts and instant deposits as well as numerous Big Guaranteed tourneys and freerolls all day, if you are playing to win BTC, BetcoinPoker.com is a great place for you. 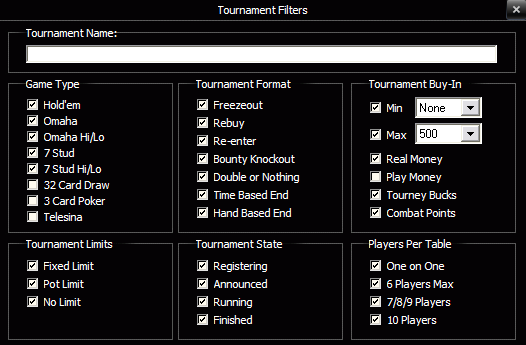 Each of these tourneys, players can earn entry simply by playing in ring games. Once entered into the tourney, players will have a shot at the 1,500 BTC ($1,000,000) guaranteed prize pool with 330 BTC ($200,000) guaranteed to the winner. More details on the Winning Millions will be announced soon. For further information, visit www.BetcoinPoker.com. As always, we appreciate any comments, questions or suggestions that you may have. Bet Coin Poker joined forces with the Winning Poker Network and now offers entry into the largest guaranteed poker tournaments that Bit Coin Players can find. Read more about Bet Coin Poker and Bit Coin Poker Here. On Sunday, December 14th at 3:00pm ET, Americas Cardroom and the Winning Poker Network will be holding a $1,000,000.00 Guaranteed tournament, that’s right $1 million GTD tourney! The tournament’s name is Winning Millions and the buy in is going to be $500 + $40. Yes, there will satellites. Between now and December 14th approximately 620 guaranteed seats to the Winning Millions will be awarded. This gives everyone 6 months to accumulate their bankroll to buy their way in or win a seat via satellite for a legitimate chance at a “lottery sized” poker tournament win that will be a life changing event. I will have more details as I get them, There will plenty of info on this Event upcoming. 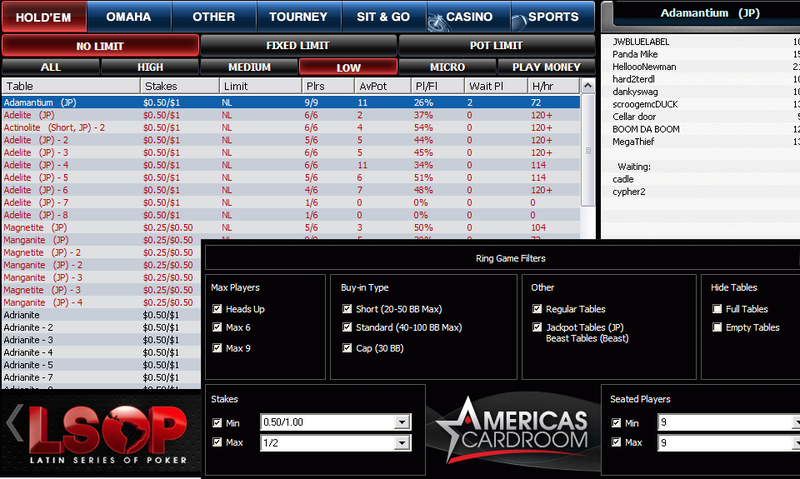 • The entire final table (top 9 players) will get one free bank wire to withdraw their winnings. On Wednesday, July 16, 2014 ACR will announce that they will add $10,000 to the Weekly Beast (for 6 weeks, totaling $60,000) and $5,000 to the Weekly sit & Crush (for 6 weeks, totaling $35,000). That’s an additional $95K in free money for all you ring game players……. Don’t miss the $100K GTD Tournament tomorrow, Sunday July 13 on ACR, It starts at 3PM ET. 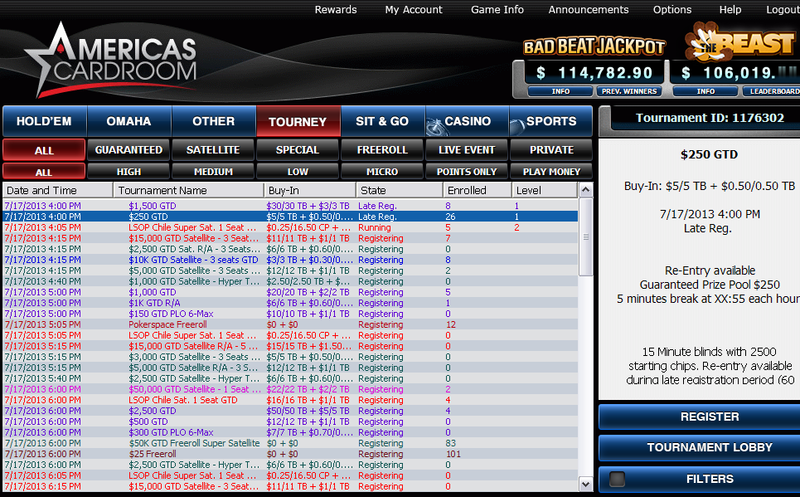 25 Events over 5 days, $350,000 in Guaranteed pools, Tournaments for players of all levels…….. Tournament Buy-ins start at $2.20 ($1200 GTD), $3.30 ($1500 GTD), $5 ($2000 GTD), $11 ($5000) and with the $55, $109 and $215 buy-ins the guarantees soar to $20K, $25K and the Mega Main-Event on November 24th at 5PM ET with a unbelievable guarantee of $150K…………..
Americas Cardroom offers 100% Deposit Bonus, the fastest Cash-outs for US players and the most guaranteed tournaments online for US players. 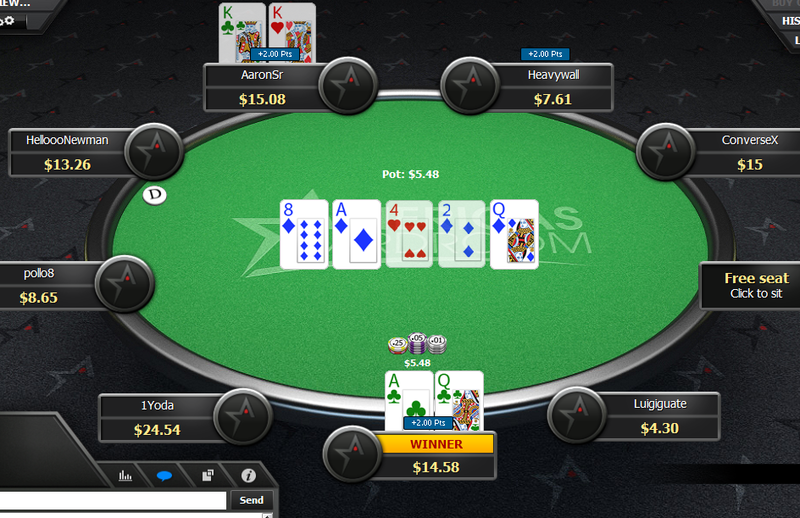 We reported earlier about ACR launching their new Poker Client earlier today, well let me say this, It look’s freaking great…………. 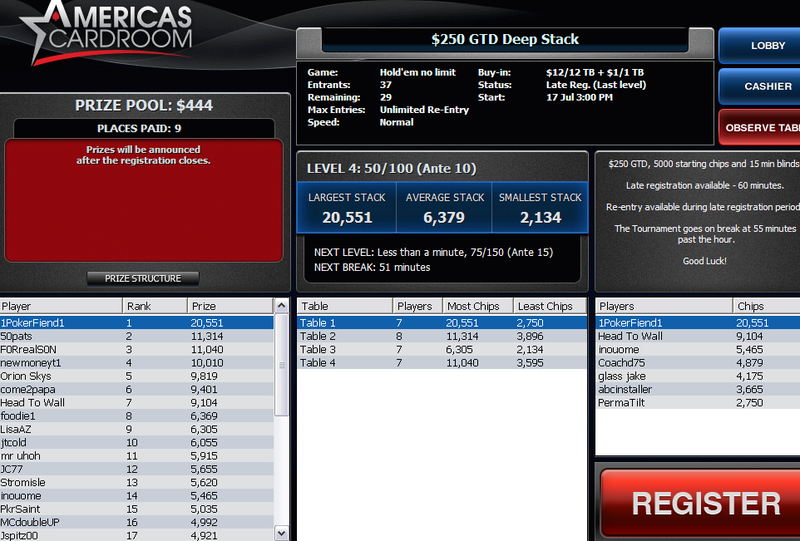 We went on Americas Cardroom for just over a hour on Wednesday afternoon and just started to look around, we signed up for a Free Roll and tried the new poker platform, it is head and shoulders above what I just played on ACR just this past Monday, WOW! 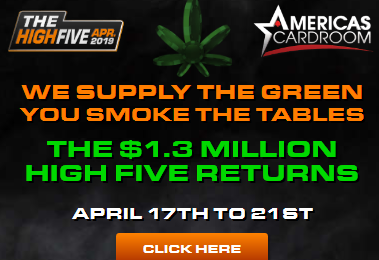 Americas Cardroom has been promising this day for what seems like a over a year and there had been rumblings that the new client would be ready in early July 2013, well they waited until the 17th of July, and the wait was worth the time…. The ACR and the Winning Poker Network (WPN rooms include True Poker and Black Chip) has worked hard on this upgrade and it really shows. I really like what I have seen (you will too) so far and will report on anything else I find (good or bad) in the next couple of days of playing. We will update our Americas Cardroom Review in the next few days, just remember everything else is the same on ACR, the same 100% Bonus, same easy deposit options, same super fast and reliable debit card cash-outs and the same great Guaranteed Tournamentson ACR. 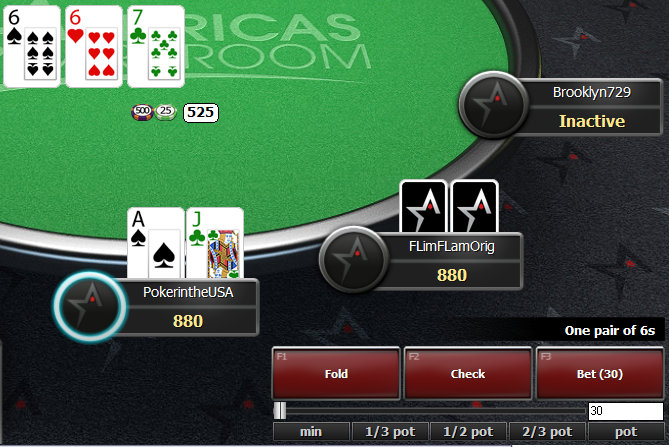 The only thing different on ACR is completely new software that makes your play a little more enjoyable. The Winning Poker Network (Home of Americas Cardroom) is getting bigger and better than ever! This means more players, more ring games, more tournaments and larger Guarantees for all players on the Winning Poker Network. San Jose, Costa Rica – November 30, 2012 – Black Chip Poker, Merge Gaming and the Winning Poker Network have jointly announced today that effective December 3rd, 2012, Black Chip Poker, its players and affiliates will move off the Merge Gaming poker network. Following that, Black Chip Poker will begin operations on the Winning Poker Network. All active Black Chip Poker players and their account balances, as of Moving Day, will be accessible as of the next day through the new Black Chip Poker presence on the Winning Poker Network. Black Chip Poker players will have their client seemlessly upgrade on Monday after it closes on Merge Gaming. Merge Gaming and Winning Poker Network have arranged for the Winning Poker Network to take full responsibility for all the current player account balances when Black Chip Poker moves. Upon the move to the Winning Poker Network, Black Chip Poker players will have access to their player accounts through the new software at the Winning Poker Network. Following the move, neither Merge nor the Kahnawake Gaming Commission will have further liability for the Black Chip Poker player accounts transferred to the Winning Poker Network. Black Chip Poker thanks Merge Gaming for the opportunity to establish and grow Black Chip Poker as a premier brand for serious poker players. The move to the Winning Poker Network, and WPN’s welcome for the Black Chip Poker players, brand and management team, foresees continued provision to its players of a favorable poker climate and play experience.